Information gathered with the Hubble Space Telescope (HST) has transformed our perception and understanding of the universe. Since its launch in 1990, astronomers and other space scientists have used an array of instruments carried on the HST to complete over a million observations and collected data reported in more than eleven thousand scientific articles. The HST mission has become synonymous with spectacular multicoloured images of the cosmos that have been reproduced in a wide variety of media and formats including scientific journals, magazines, bedroom posters, television programmes, smartphone covers, and digital prints on designer clothing. Websites and social media provide access to a vast and ever expanding number of HST images. 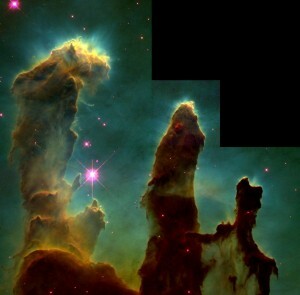 In many ways, Hubble images of celestial objects, such as the 1995 ‘Pillars of Creation’ depicting interstellar dust, gas, and formation of stars in the Eagle Nebula, epitomise cutting edge of space exploration, the majesty and enigmatic beauty of the universe, and scientific discovery of new worlds using the very latest technology. Although Hubble images are often described as direct images of astronomical objects that are without precedent, scholars such as Elizabeth Kessler have drawn attention to their relationship with nineteenth century frontier photographs and paintings by artists including Thomas Moran and Albert Bierstadt. There’s ample evidence to support the claim by Kessler and others that HST images incorporate aesthetic features such as composition, lighting styles, and most notably the saturated colour palette found in landscape paintings of the America West by Moran and others from the Hudson River School as well as works by European Romantic artists. It’s not the first time that scientific images of space have been compared to nineteenth century works of art. In the 1940s and 1950s, prior to the launch of Sputnik, space artists including Chesley Bonestell, Ralph Smith and others used a blend of scientific evidence such as photographs taken with telescopes and artistic licence to create what were considered to be realistic pictures of planetary landscapes. In addition to working alongside leading astronomers, Bonestell acknowledged his depictions of extraterrestrial landscapes were partly inspired by the visual tropes of perspective, light and shadow, and colour palette of the nineteenth century artists, notably the French painter and printmaker Gustave Doré. Bonestell’s paintings of spaceflight and imaginary views from the surface of other planets were incorporated in factual science books as well as popular science and general magazines. 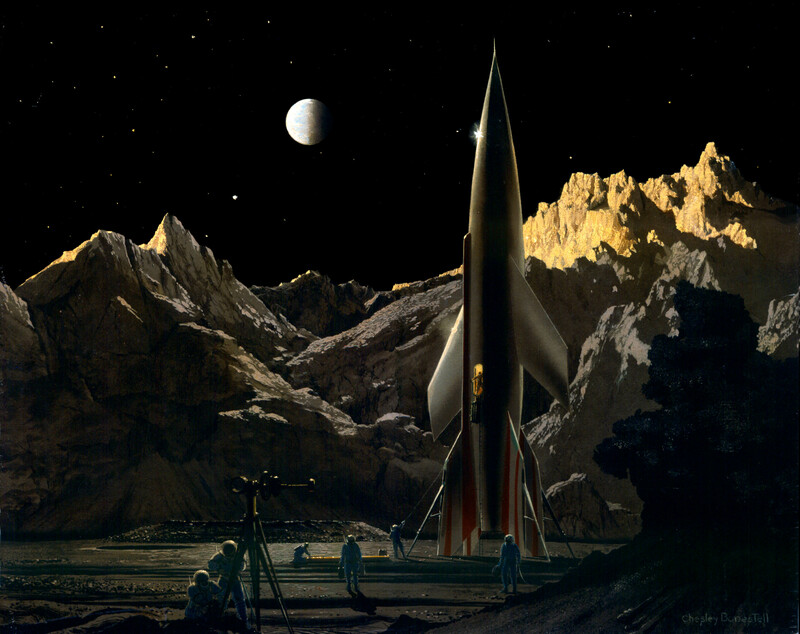 He also created large-scale matte paintings of planetary landscapes for Destination Moon (1951) and other science fiction films. 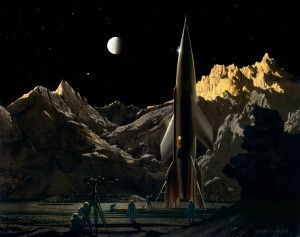 At the time, Bonestell’s depictions of other worlds for print and film media were perceived as scientifically plausible. The images were meant to stimulate the imagination in addition to illustrating scientific knowledge. Both before and after spaceflight was accomplished, scientifically plausible depictions of other worlds incorporated observational data and aesthetic choices. There is a long history of planetary scientists and their co-workers making stylistic choices to produce photographic images of planets and celestial objects. During the 1970s, images of the outer planets acquired using NASA’s Pioneer 10 and 11 and Voyager 1 and 2 space probes were widely disseminated in both scientific publications and across a wide range of news media. Photographs and moving images of planets and their moons were heralded by scientists and media producers as not only spectacular but also a practical demonstration of NASA’s unparalleled technological proficiency in the field of planetary exploration. In particular, colour images of Jupiter, Saturn, and their moons acquired by Pioneer and Voyager spacecraft were well suited for reproduction in print media, television, and film. The Voyager mission team at the Jet Propulsion Laboratory (JPL) had access to a well equipped Image Processing Laboratory with technical resources and expertise for creating and disseminating tens of thousands of images throughout the Grand Tour of the outer planets. 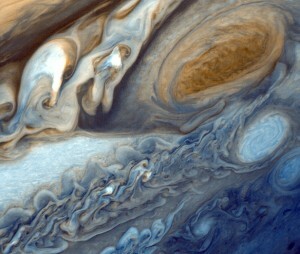 Captions for some Voyager photographs of Jupiter and other planets explained that the images had been processed by scientists and photographic technicians in order to highlight unexpected physical features that would otherwise be illegible. Importantly, the scientists and media producers used photographs obtained during planetary flybys to substantiate scientific claims and highlight aesthetic properties of the outer planets. At times it is difficult to distinguish between science and artistry when viewing images of planetary structures and atmospheric processes such as Jupiter’s Great Red Spot. This is not surprising if one considers that reports of planetary missions in news and entertainment media included pictures that were meant to stimulate interest and garner public support as well as convey scientific knowledge to lay audiences. Historian of science and technology Peter Westwick has observed that JPL’s Image Processing Lab created custom-built software in the 1970s to filter out digital noise and process images obtained from Voyager and other deep space probes. A decade later commercial image editing software such as Photoshop incorporated many techniques originally developed at JPL. It’s ironic that recent debates about the extent to which Hubble photographs have been colorized overlook the provenance of the software and the deeply enmeshed histories of space exploration, image processing, and digital technology. In contrast to the notion of cleaning up digital images for public consumption, a number of contemporary artists have collaborated with NASA to produce images of space and celestial objects that exhibit a strikingly different aesthetics. Artist duo Ruth Jarman and Joe Gerhardt (also known as Semiconductor) used data sets from NASA satellites to create remarkable images, film, and sounds that reproduce artifacts or noise rather than attempt to filter them out. The film installation Black Rain (2009) is based on image data collected by interplanetary twin spacecraft STEREO (Solar TErrestrial RElations Observatory) on a mission to trace the flow of energy and matter ejected from the Sun towards Earth (coronal mass ejections). As in Semiconductors previous work ‘Brilliant Noise’ which looked into the sun, they work with raw scientific satellite data which has not yet been cleaned and processed for public consumption. By embracing the artefacts, calibration and phenomena of the capturing process we are reminded of the presence of the human observer who endeavours to extend our perceptions and knowledge through technological innovation. I find their work original and a refreshing change from the opulent colour saturated images associated with the HST and the inexorable pursuit of noise-free high definition images of space exploration in mainstream entertainment media such as the film Gravity (2013). Black Rain (2009) and Brilliant Noise (2006) combine sound and images of an energetic and volatile universe in which simple binary distinctions such as science/art, signal/noise, and natural/artifact are rendered obsolete or, at the very least, deeply problematized. The title ‘Black Rain’ refers to solar radiation depicted as falling in all directions through black space. It also alludes to the toxic radioactive black rain that fell from the sky above Nagasaki and Hiroshima following the detonation of nuclear bombs. 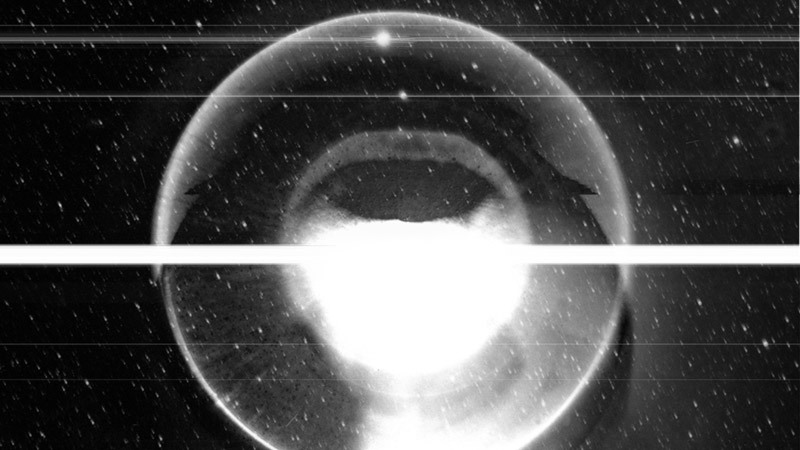 The film invites us to contemplate the ways in which radiation is portrayed as we’re hurled along a vertiginous journey through space, catching the occasional glimpse of sun, blasts of of solar radiation, and comet dust trails amidst dissonant sounds that trace the ebb and flow of objects that flicker and stutter across the screen. It’s worth remembering, perhaps, that some visual and acoustic artifacts from earlier space missions were interpreted as markers of authenticity of space exploration. For instance, the familiar beeps or Quindar tones heard during radio transmissions between staff at Mission Control Center and astronauts in space, and the black crosshairs (fiducials) on Apollo photos taken with lunar surface Hasselblad cameras. However, it is evident in the Semiconductor films mentioned above that the filmmakers are less interested in using audiovisual markers as calibration tools than in showing the physicality of knowledge production and the perseverance of human observation. Gerhardt and Jarman’s work also highlights the role of human agency and technology in exploring environments beyond Earth that bear no resemblance to terrestrial landscapes. Their films acknowledge rather than elide how knowledge about the universe is produced by humans, machines, and the world we inhabit.